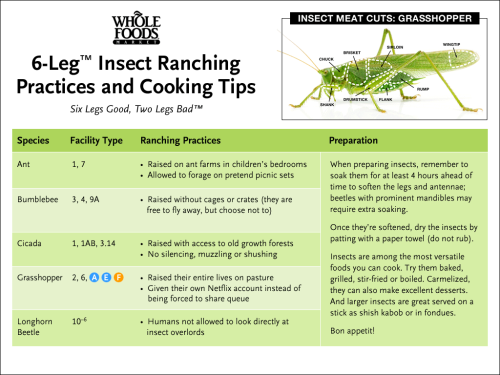 Whole Foods posted a fake "insect ranching practices" chart on their website last Friday for April Fool's, a lovely parody of the often complicated food location breakdowns that are posted in Whole Foods grocery stores. (Cicadas are ranched with "No silencing, muzzling, or shushing.") But blogger and entomophage Girl Meets Bug decided to use this as a teaching moment, discussing The increasing acceptance worldwide of insects as food! I especially like the comparison she uses of sushi, which at one time was also viewed with derision, yet is now commonly eaten across the country. As somebody who can personally attest that 3 of the 5 species listed are in fact delicious, I heartily welcome such charts becoming a reality. This entry was posted in cuisine, insect and tagged april fool's, cuisine, cyndrekit, entomophagy, Girl Meets Bug, insect. Bookmark the permalink.